I don’t think it would be so hard, if the assignments actually had detailed instructions, if the instructor made it clear what he expected, or if when we received a poor grade on an assignment, he told us why. In my English class we have three papers to write for the entire semester. The grade we receive on the ROUGH DRAFT – which is graded as if it is a final draft – has just as much weight on our final semester grade as does the final paper. We turned in our rough draft, and the final was due two weeks later. The day the final was due, the instructor finally gave us back our rough drafts and extended the final deadline by ONE DAY! I struggle each day to decide what to do for my business. I struggle to prioritize my life because I still want to do pretty much everything. In addition to being a full-time student, I am also a full-time wife and a full-time business owner. Currently, I am dealing with Postural Orthostatic Tachycardia Syndrome (POTS) which is a form of orthostatic intolerance that is associated with the presence of excessive tachycardia on standing. Many POTS patients experience low blood pressure on standing, fatigue, headaches, lightheadedness, heart palpitations, exercise intolerance, nausea, diminished concentration, tremulousness (shaking), syncope (fainting), coldness or pain in the extremities, chest pain and shortness of breath. If that wasn’t enough, I’m also recovering from a brain surgery in March which effected my balance as well as my ability to do normal every day tasks. The hardest part of this recovery was learning to walk again. We wouldn’t want to leave out the fact that I have extreme back difficulties for a 29 year old woman. For this, I go to 1.5 hours of therapy 4 times a week. So, as you can tell, I’m a very busy lady. The truth of the matter is being this busy is not working for me. It is far too stressful, and we all know that when you are trying to regain your health, extreme stress is not going to help. We can’t always dictate what our health will do. Sure, we can eat healthy, exercise, and take care of ourselves, but sometimes or bodies just do their own thing. the best thing we can do about it though is keep working to make it better, continue going to therapy, eating right, exercising, and treating our bodies well, so for obvious reasons I can’t get rid of that from my life right now. Another area of life that requires attention is the fact that I am a full-time wife. Relationships require work and love in order to grow. It’s important for me to spend time nurturing my marriage and spending time with my husband. He deserves that! Part of this nurturing requires that I put in just as much effort around our house as he does. It’s not fair to expect him to mow the yard, do the dishes, clean the clothes, vacuum the floors, take care of the dogs, take out the trash, and cook the meals. We are partners and therefor we work together to keep the relationship and our home maintained. I can’t alleviate this from my life either. Last week my husband and I talked about my business. We discussed what our life goals were and what needed to happen to accomplish those goals. For us, Pretty Much is one of the most important pieces of my life right now. It is the one piece that makes the most sense and makes me the most happy.Despite the business taking a lot of love, dedication, time, and work, it seems to be a stress reliever more than a stress creator. Owning and operating Pretty Much keeps me sane and makes me feel good. It’s such an important part of my life, and of our future that I would be crazy to cut it out of my life right now. This brings us back to the talk of school. I’m supposed to devote 10 hours a week per class. That’s 40 hours a week devoted to school. Normally, I wouldn’t have a problem with this expectation, however, that number doesn’t even come close to the amount of work that I have to put in. Last week I was required to create a 108 page document for one class in one week. It took me 20 hours just to work on that class, and I still had three other classes to work on. Did I learn anything from creating that document? nope! That’s when I realized that school is taking up way too much of my time and not giving me anything back. I’m not really learning anything, and it causes way too much stress. It needs to go. So for me, I’ve decided that right now in life, college is a waste of my time. I’ve decided that this will be my last semester for a while. The crazy thing is that several of my classmates have actually said the same thing. At least I don’t feel so bad. The great news is that this means tons more time to focus on Pretty Much! Hooray! I’m so excited because that means that I am about to have a ton of time to make pretty things! 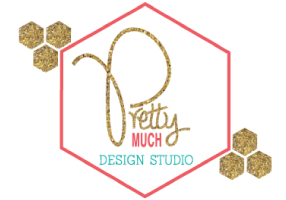 I’m about to have time to blog, create pre-made party details, develop some new stationary collections, and even start making some videos. I cannot wait for this new era to begin with Pretty Much. On Tuesday, I’ll be sharing a bit more about upcoming plans, so come back and find out more!